The Bastille Upholstered Cafe Stacking Chair, inspired by Xavier Pauchard, is a testament to the truly adaptable nature of his famous Marais A Chair (aka Tolix Chair). Designed almost a century ago in France, the Marais A / Tolix became a mainstay in cafes, restaurants, establishments and homes all over the world, and has enjoyed a revival in popularity in recent years. The Marais / Tolix design has been interpreted in many ways through experimentation in materials, color and texture. 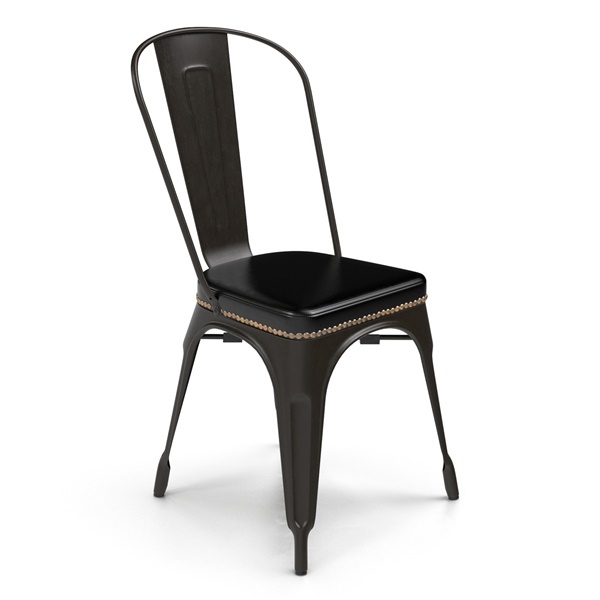 The Bastille Upholstered Cafe Stacking Chair stays true to the original form and construction and features the addition of a comfortable padded seat, wrapped in a leatherette with an aged look and vintage styling, and is accented by a row of distressed brass-colored studs. had to have them upholstered! I've seen these chairs everywhere but not upholstered like this, I KNEW I HAD TO HAVE THEM! They are spectacular! Worth it! Classic feel and design, absolutely love the white frame with the honey upholstery, a gorgeous combination! Love the nailhead trim around the seat cushion, these were a great find! Silver and gray leather is where it's at! SO ATTRACTIVE! ESPECIALLY with that brass trim around it, it has a rockstar look - love, love, love!! I had my eye on the bastille chairs for a while but wasn't sure how comfortable or supportive they would be, I was happy to see them with leatherette upholstery and cushioning - definitely a better fit for my style, they look awesome, thank you!